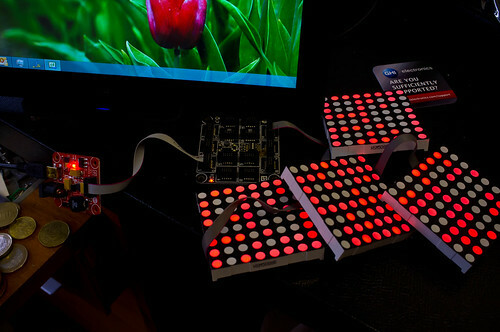 Earlier this week I was lucky enough to get hold of some LED Matrix modules for Gadgeteer. These give a decent sized array of 64 leds. They are really easy to program, and they use the GHI DaisyLink protocol, which means that they can all be controlled from a single Gadgeteer port. Each device links to the next to make a kind of daisy chain, which is where the name came from I guess. Each of the display modules contains an ARM processor which you can load with your own software (although you’ll have to be a pretty good developer to do that). One other neat thing is that I managed to power four of them (as you can see above) using a single USB output from my PC. I was worried that having 256 leds powered from a single port might cause problems with the current available but they work fine. At the moment my program just displays random patterns (like those computers they had in 70’s movies) but I’m going to have a go at displaying scrolling messages and even lo-res pictures. I reckon you could even get a very simple pong game working on a 16x16 display. Staying with Gadgeteer, if you want to find out all about how my Tweet Printer works, there is a full writeup on the Gadgeteer website (http://www.netmf.com/gadgeteer/) where it is a featured project at the moment. I actually gave the first printer to the Gadgeteer team, I’m presently building a replacement.